Aurelio, a new UK craft beer created to help fund the battle against prostate cancer, has been awarded the top prize at the International Beer Awards in Italy. 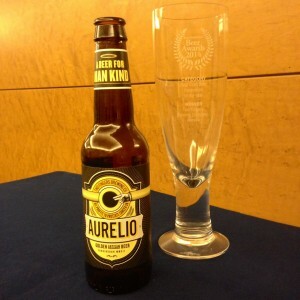 Aurelio, which gives all profits to Prostate Cancer UK and is the first beer from the brewing firm Two Fingers Brewing Co., was awarded Best Craft Beer Innovation at the awards ceremony. Appropriately enough, but by complete coincidence, the awards, dubbed “the Oscars of the beer industry”, were held in a district of Rome also called Aurelio. Aurelio was launched just four months ago after its founders, seven ad men, decided to combine their love of craft beer with their marketing expertise to create a beer brand that wasn’t just better tasting, but better for men everywhere. Two Fingers Brewing Co. was established in January this year and the award recognises the unique positioning of its pioneering beer brand as the only beer to put men’s health before profit margins. Aurelio, a fine 4.8% golden ale, is brewed and bottled at cost by award-winning craft brewers Hepworth & Co. It is available through Tesco and is set to be stocked by Morrisons and Ocado.